WS 100 photo with volunteer Wayne Miles. The 41st running of the Western States 100-Mile Endurance Race will begin in Squaw Valley at 5:00am, Saturday, June 28, 2014. The 100.2 mile course that finishes in Auburn will not have to be re-routed due to the American Fire last August. The American Fire (August 10-29, 2013) burned more than 27,000 acres, including a 20-mile stretch of the Western States Trail near Deadwood Canyon. 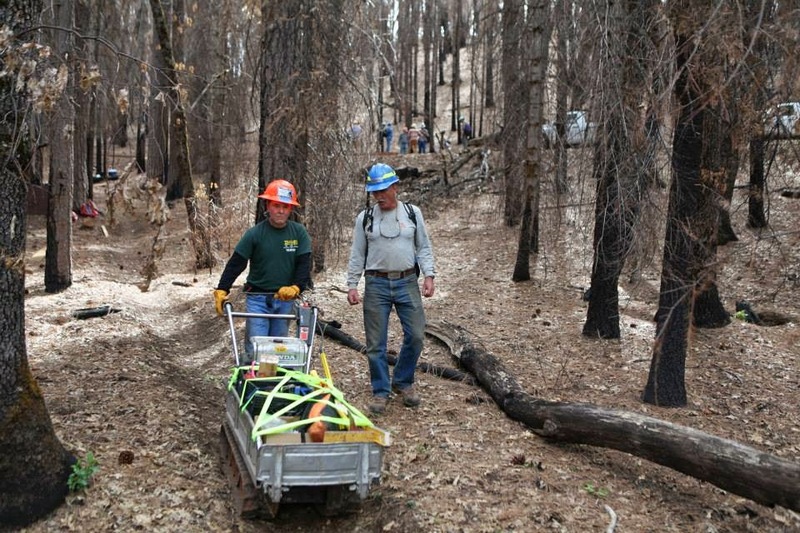 After the fire, the Western States Trail Foundation/Tevis Cup horse ride coordinated a group of volunteers that accumulated more than 6,000 hours to make the course runable. Volunteers added a new bridge to replace the burned Pacific Slab Mine Bridge near the half-way point in the race. Bridge pieces were hauled nearly one mile into a steep canyon. Another bridge at the bottom of Deadwood Canyon on the North Fork of the Middle Fork of the American River was not completed so the runners will cross the river with a safety cable. 350 runners will be aided by 1,500 volunteers along the challenging course that crosses Emigrant Pass and finishes on the track at Placer High School in Auburn.